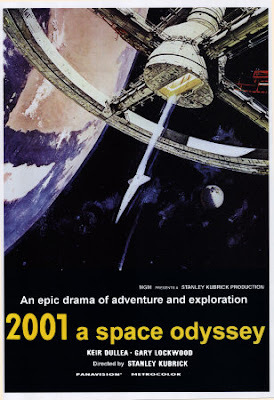 I finally got round to watching 2001 A Space Odyssey. I wont even attempt to define what its all about... ideas of death and rebirth... of travel and limits... just seem small in comparison with the grandeur of this film. I will, however, rave on about how it is a visual and aural delight. The cinematographer is simply breathtaking. Unique. Enhanced by a tight attention to detail. The realism of space travel is remarkable - the quiet of space and the effects of gravity are reproduced with startling realism. The design of the sets was also fantastic. You could talk for a long time on the different chairs used or the computer consoles. The sound is a wonderful treat too. The ambient noise adds to the experience. The breathing, for example, is extremely disconcerting but amplifies the experience of being in a spacesuit. The music is a real pleasure out of context (the soundtrack contains some of the best orchestral music ever made)... but... in the context of the film the music enhances the cinematographery and creates a synergistic marriage of beauty and elegance that has no real parallel other than John Williams work with Star Wars. Truly a wonderful film in the most holistic of ways. Loved it. watch the film sunshine if you have a chance. equally compelling cinematography. oh and mogwai's rock action or CODY seems to fit with 2001 perfectly. you can almost turn down the volume and turn up mogwai and it works.